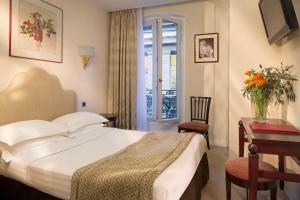 Each room mixes contemporary decor with antique furniture and has a flat-screen TV. 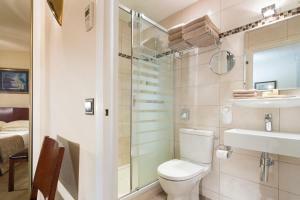 Individual private bathrooms are equipped with a bathtub or shower. 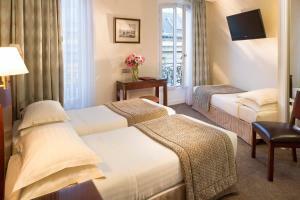 The rooms on the upper floors offer views over the rooftops of central Paris. Guests can enjoy a daily breakfast in under the stone arches in the breakfast area. Room service is also available in guests’ rooms throughout the day. From Hôtel Delavigne it is possible to visit many famous sights on foot including Notre Dame (10 minutes) and the Louvre (15 minutes). 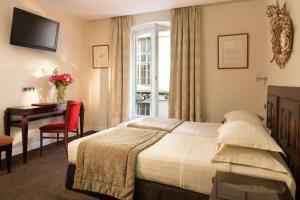 Boulevard Saint-Germain, with its famous cafes and boutiques, is a 5-minute walk from the hotel. Guests are required to show the credit card used to make the reservation and the corresponding photo identification upon check-in. Please note that from 11 December 2017 to 01 January 2018, guests will not be able to use the lift, which will be going through renovation works. During this period of time, guests staying at the property will enjoy continental breakfast for free in the hotel's breakfast room. 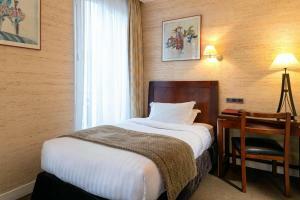 This air-conditioned room includes a TV with Satellite channels, heating and a private bathroom with a hairdryer. The decor of this room is colourful and it has wooden furniture. This air-conditioned room includes a TV with Satellite channels, heating and a private bathroom with a hairdryer and a bathtub. The decor of this room is colourful and it has wooden furniture. 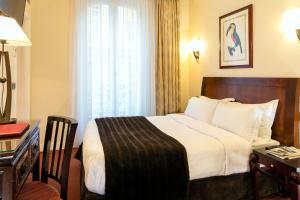 This air-conditioned room includes a TV with satellite channels, heating and a private bathroom with shower and hairdryer. The decor of this room is colourful and it has wooden furniture.